Raycen Scott Wong was born and raised on the Big Island of Hawai‘i. 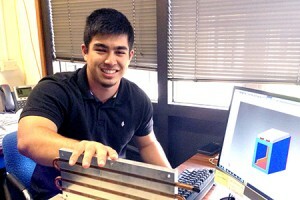 He will be entering his senior year in Mechanical Engineering Program at the University of Hawai‘i at Ma?noa. During his free time he enjoys working on as well as racing cars, going fishing and camping, exercising, and playing sports. In the future, Raycen would like to find a job here in the state of Hawai‘i, preferably on the Big Island. He finds the component design aspect of engineering most interesting. One of the goals he has set for himself would be to design something someone has never seen before that would make a change in society for the better. Project Abstract: Heat produced by the Canada France Hawaii Telescope’s (CFHT) Wide Field Infrared Camera (WIRCam) causes decreased image quality. WIRCam contains two detector controllers that produce heat. The total heat generation of WIRCam was estimated using radiation and convective heat transfer equations and resulted in roughly 830 Watts of heat. The purpose of this project was to mitigate the heat produced by WIRCam and decrease the overall temperature of the instrument. To dissipate some of the heat being produced, a cooling system was designed for the WIRCam controllers. The cooling system extracts the produced heat via heat exchangers and transfers the heat into the cooling fluid. The placement of the provided heat exchangers was crucial to maximize the efficiency of cooling. The decision to mount the heat exchangers on the top of the controllers was made based on the fact that heat rises due to density changes of the air related to increased temperature. The prevalence of near freezing temperatures on the summit resulted in the selection of a glycol-water mixture as the cooling fluid due to its low freezing point. Adjustable flow valves were implemented in the design to manage the flow of each individual heat exchanger because the flow will take the least restrictive path into the heat exchangers. After a preliminary design review, modifications were made to ensure the safety and efficiency of the final design. The design was implemented to accommodate the clearance of the controllers to the outside shell, cool the system efficiently and increase the image quality. It is recommended that this system is tested off of the instrument to ensure clearance, zero leakage, efficiency and determination of the total amount of heat being mitigated.